During 2014 - 2015, there was a series of four lunar eclipses, with the first being on April 15, 2014. This phenomena has been called, by some people, "four blood moons," and in a few religious belief systems, is seen as a harbinger of prophecy. However, October's full moon also happens to be called the Blood Moon in some belief systems, so we've been getting numerous emails trying to parse out the confusing fact that the term is used in both ways. So here's the deal. The series of four eclipses known as "the four blood moons" was made famous by evangelical minister John Hagee, who wrote a book called Four Blood Moons: Something Is About to Change. Hagee warns that a "world-shaking event" will happen between April 2014 and October 2015, although he doesn't specify what it is, but it's supposed to be religiously significant to Hagee and his followers. 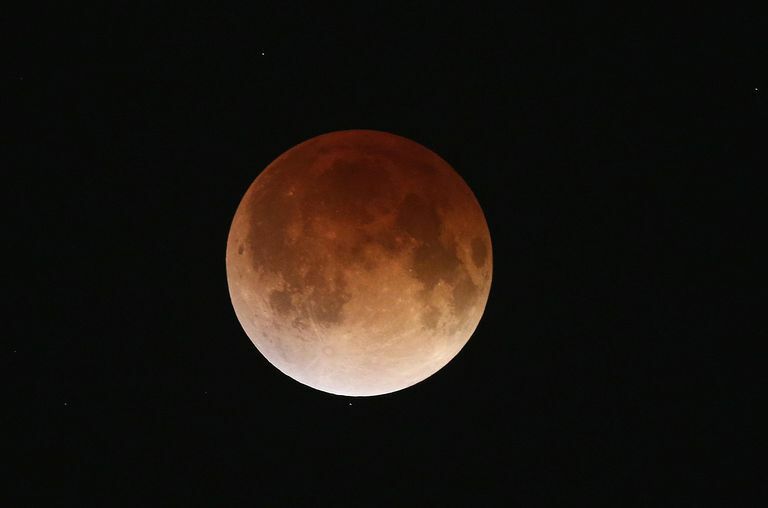 Why the term "blood moon"? Well, sometimes when things line up just right during an eclipse, the moon appears reddish in color - problem is, no one can really predict this in advance. Of course, Hagee insists that it's all part of Biblical prophecy, and quotes the New Testament to prove his theory: "And I will show wonders in Heaven above and signs in the Earth beneath, the sun shall be turned into darkness and the moon into blood before the coming of the great and awesome day of the Lord." He also explains that since the upcoming four lunar eclipses - called a tetrad - all fall on dates with religious significance, that can't possibly be just coincidence. So - the October full moon, which is traditionally called either the Hunter's Moon or the Blood Moon, doesn't really have much to do with Hagee's prophecy - although the October full moon also happens to be the date of one of the eclipses in the tetrad. The prophecy of four blood moons appears in the Hebrew Bible, in the Book of Joel, which states "the sun will turn into darkness, and the moon into blood," as a predecessor to the arrival of the Lord. In the Christian Bible, this phrase appears in the Acts of the Apostles, which is part of the New Testament, from which Hagee quotes. Interestingly enough, the whole tetrad phenomena really isn't that rare. It happened in 2003 - 2004, and will happen again seven times before the end of the century. It's a normal part of the solar system's activity, so it's probably not worth getting overly worked up about, since it's just how science works. Draw your own conclusions on how much religious or metaphysical significance this event actually has. Why Is There a Beautiful Ring Around the Moon?